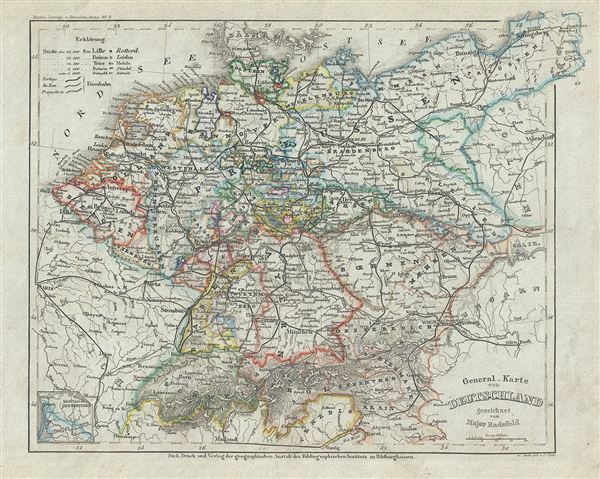 This is a beautiful 1852 map of Germany and Prussia. It covers Central Europe and the German states including the Holland, Belgium, Prussia, Austria, Switzerland, Germany and Bohemia (Czech Republic). Throughout, the map identifies various cities, towns, rivers and assortment of additional topographical details. Prussia attained its greatest importance in the 18th and 19th centuries when it dominated northern Germany politically, economically, and in population. The German Confederation, created in 1814, acted as a buffer zone between Austria and Prussia, its two largest and most powerful member states. Nonetheless the rivalry between the two powerful states increased until it finally broke out into the Austro-Prussian War. Prussia won the Austro-Prussian War in 1866 which ultimately led to the collapse of the German Confederation. A few years later, in 1871, most of the former Confederation states were folded into the newly proclaimed German empire. This map was issued as plate no. 9 in Meyer's Zeitung Atlas. Although all the maps in this atlas are not individually dated, the title page and maps were often updated while the imprint with the date was not, causing confusion to the exact date for some of the maps. Moreover some maps in the atlas were taped in at a later date as an update to the atlas. We have dated the maps in this collection to the best of our ability.